Diwali is a festival of lights, great food, and enjoyment. If you are planning to host a Diwali party at your home, office, or community center and want it to be a total sell-out then the first thing you need to do is design a customized party invitation with Canva. Don’t worry, working on Canva is incredibly simple, requires zero designing knowledge, and is completely free. 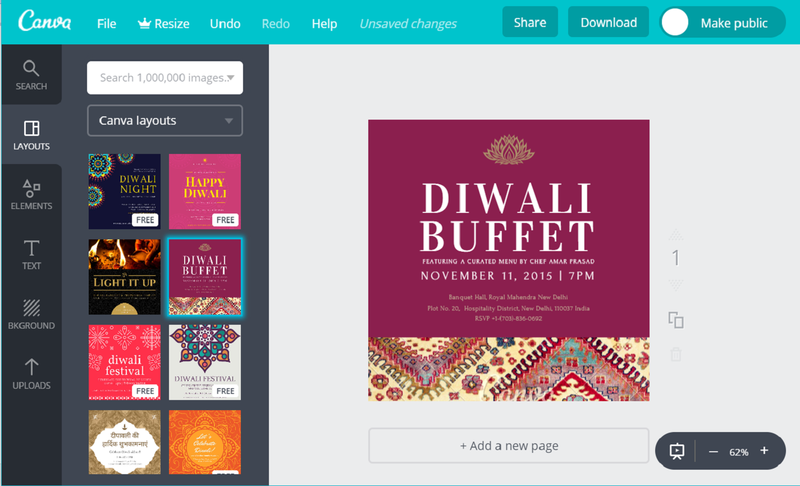 Canva’s team of professional designers have created ready-to-use Diwali centric designs. You can choose from hundreds of Diwali invitation designs, portraying various themes. It doesn’t matter whether you are hosting a rangoli competition at your organization or a dinner party at your home, Canva has invitations for every celebration. You are free to use these invitations as it as or personalize them using our intuitive set of design tools. Create a new Canva account to get started with your own Diwali invitation. Make a personal invitation for your Diwali celebration through Canva by replacing the stock images in the layout with original pictures of the venue, activities, or mouth-watering delicacies guests will get to relish. To add images, all you have to do is click on the ‘Upload your own image’ tab and select the desired images from your computer. Once uploaded the images get saved in your Canva account and can be used in all your future designs. To make your invitation design look seamless, you can resize, crop, and apply various filters to the uploaded image. At Canva you are not bound to choose only from a given set of pre-designed layouts. Instead you have the freedom to create your very own design since with the help of the many designing tools. All you have to do is open your Canva account, click on ‘Create a Design’ tab and get started. On the blank layout, you can add images, text, and other visual elements making your Diwali invite unique and one-of-a-kind. Don’t forget to take help from Canva’s amazing set of designing tools like elements, text, background and search bar. You can also take advantage of Canva’s media library which has over a million images. Most of them are free, while only a few are priced at a low cost of $1 each for one-time-use. With Diwali just around the corner, and you hosting an amazing event, there is hardly any time to give away invitations personally. Luckily with Canva, you can send out designed Diwali invitations via email or through social media platforms like Facebook, Twitter, and Linkedin. Another great way of sending invites is through messaging apps like Whatsapp and Viber. For that, you can download the Diwali invitation in JPG format and forward the invitation as an image to friends and family. Is it mandatory to create an account on Canva for designing an invitation? To use Canva for designing or inspiration purposes, you will have to create an account, which only takes a few seconds and it will give you access to all your past designs anytime, anywhere, and also enable you to share those designs instantly with friends and family. Apart for the paid elements, are there any other charges? Using Canva’s design tools is absolutely free. Our media library stocks over a million of images, illustrations, and graphics. Most of them are free, while only a few cost $1. Can I print the Diwali invitation? Absolutely yes! You can get your Diwali invites printed and use them to personally invite guests. Click on the download tab, choose the recommended PDF-Print format and get the printable file saved on your system to get a print out.